In To restrict dynamically the usage of Domain Properties in DSL Models I described a way to restrict the usage of certain domain properties by the user. You can define different modes for your editor and thus allow or prevent the usage of domain properties via attributes on your domain classes. The technique is described in the linked article and the code is released as part of JaDAL – Just another DSL-Tools Addon Library. This is a pretty static way to control the domain properties. You have to define a few modes and decide at design time the visible and active properties for each mode. Sometimes you need a more dynamic way: So I introduced another attribute CustomRestrictedPropertyAttribute and an interface ISupportsUserRestrictions. If this attribute is present, the library will call the GetRestriction() method of this interface and your user code can decide whenever the domain property will be visible, hidden or read only. I built a small example: a domain class contains a few properties: CustomPropery, CustomPropertyVisible and CustomPropertyReadOnly. The two flags cause the first property to be visible, hidden or read only in the properties window. This example can be downloaded as part of the JaDAL source code. Currently you have to catch the code directly from the Source Code tab at CodePlex since it isn’t part of the latest Release yet. Over the time I build some libraries that enhance the Microsoft DSL Tools framework and post them here. I wrote a number of articles and for many of them I provided a download with source code or examples. However we all know: zip files are a bad version management system! I decided to put all these code together and compose a single library with addons for the DSL Tools, name it “JaDAL – Just another DSL-Tools Addon Library” and publish it at CodePlex. I will continue to write articles here, but now you can always find the latest code at CodePlex. If you are interested in my work with the DSL Tools, just take a look at JaDAL. Few months ago I wrote a series of articles and released a library to create connectors between the entries of compartment shapes in Microsoft DSL Tools. In the meantime I found a setting that wasn’t working with my library and now it is time for version 2. I will release this new version as part of JaDAL – Just another DSL-Tools Addon Library on CodePlex. If you don’t have any idea what I’m talking about please take a look at (at least) the first part of the series, but be careful and DO NOT read the second part! The second part contains obsolete information that will be corrected here. Part 3 and part 4 describe the inside of the library and they are still valid for the new version. 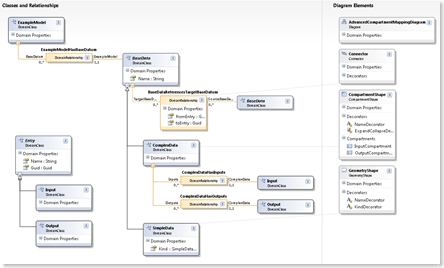 In the original version you have to decide (using the xml file) for the target and source of the connection to be mapped to a compartment or a regular shape. I thought this wouldn’t be an issue since you must know the mapping of your classes. I believed it until I created my DSL with the use of inheritance and some base class that can be mapped to regular or compartment shapes. For this base class I couldn’t create a mapping that goes from a regular or a compartment shape to a regular or compartment shape. I removed this constraint and in version 2 you needn’t care about it. The library can handle all these cases (even the trivial mapping from regular to regular shape). And even the best: it turned out that removing this constraint made the code much clearer and simpler (both the code of the library itself and the code you have to write). Before this change there were many different cases (first regular to compartment, then compartment to regular, then compartment to compartment and at the end regular to regular which throws an exception) and now everything works the same way. Lesson learned: If you can do something in an abstract and general way, don’t create different cases and handle only some of them! In the 2nd part of this series I presented a user guide with a step by step walkthrough of creating a DSL using the compartment mapping. I will now create the same DSL with version 2. Most steps are still the same but I repeat them for completeness. The main difference is the xml file format at step 7 and the class you have to write yourself in steps 9 to 11. You will find this example (and a more advanced one) in the release download over at CodePlex. You need TTxGen to generate some code from my templates. See my article for more information and a workaround for an installation problem. I assume you have a DSL solution and at least two Domain Classes mapped to two compartment shapes and two more Domain Classes used as entries of the compartment shapes created. In my example these classes are called Parent1, Entry1, Parent2 and Entry2. Create a Reference Relationship from Parent1 to Parent2. This will be automatically named Parent1ReferencesParent2. We will use this reference to present the relationship from one entry to another. I would like to create Reference Relationships from this relationship to the entries, but relationships of relationships are not supported. We have to store the guids of the entries in the relationship and add two Domain Properties for this purpose to it. I named them fromEntry and toEntry. 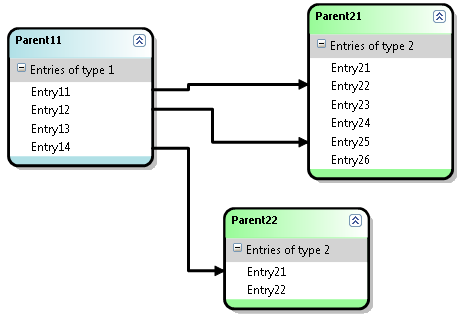 Set the Allows Duplicates property of the Parent1ReferencesParent2 relationship to true. Set the Is Custom property of the Connection Builder (Parent1ReferencesParent2Builder) in the DSL Explorer to true. Add a reference to JaDAL.dll to both the Dsl and DslPackage project. Now you have to write some code by yourself. In the generated cs file (CompartmentMappings_xGen.cs) there will be a class named Parent1ReferencesParent2BuilderInstance with three missing methods you have to override. Create a partial class in a new file and implement these methods (see 10 and 11). Implement the CreateElementLink() method in this file. Here you have to add code to store the selected compartment entries for source and target in the properties of the relationship (see 3). Always care for entry == null, this will be used to check whether the head of the shape is meant. Even if you do not allow the head to be source or target this method will be called with a null parameter from time to time. Create a partial class for your Domain Model (CompartmentMappingExampleDomainModel) and add the following methods. That’s all. The mapping from compartment entry to compartment entry should be working after compiling the solution. As I mention above you can mix compartment and regular shapes. You only need to create a DSL with these shapes and configure the xml file another way. As you see, inside the <Connection> element there is no longer a reference to the diagram elements, only the domain classes are used here. Obviously if you use inheritance all your classes need to have the same base class for <DomainClass> itself and for <EntryDomainClass>. If the concrete class is mapped to a compartment shape, the compartment mappings, otherwise a mapping of regular shapes, will be used. If one of source or target is always a regular shape, please use ModelElement for <EntryDomainClass>. At the bottom of the xml file you have to list all shapes that play a role in your mapping. Use the xml elements <CompartmentShape> and <RegularShape> therefore. In addition to the sample above I build a second one. There I want to create mappings form some Inputs to some Outputs, where one of these Inputs or Outputs can be an entry of a compartment shape or a whole regular shape. This regular shape contains a property Kind that makes the shape to an Input or an Output (to show you the use of the CanAcceptAs... methods). The project with all sources is part of the samples in the JaDAL download. 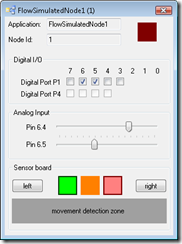 The compartment mapping library and both samples are part of JaDAL – Just another DSL-Tools Addon Library which you can download from CodePlex. One would think, it is a simple feature in the DSL Tools framework to allow and forbid the deletion of model elements, but it isn’t. One solution is to throw an exception from within a DeletingRule, but I personally don’t like this. It means, the user is able to click on a delete menu item and then an error message box pops up. This is not a good user experience! I think the best would be to hide the "delete" commands from the menus. If you disable the commands, the delete key isn’t working, too. But there are two places where the user can find such a "delete" command for the model elements: on the design surface of the DSL Editor and on the items of the DSL Explorer (and further more: the DSL Explorer has a "delete" and a "delete all" command on different tree nodes). You have to handle both cases. I would just like to have somewhere a bool CanDelete() method that is called every time the menu is shown and asks my component whether to allow the deletion or not. Now the good news: I added this Method and wrote a little piece of code for it! With this interface you can add the missing method to your shapes or model elements. I recommend to implement this method in the model elements since the model explorer knows nothing about your shapes and cannot call this method if implemented in the shape classes. You don’t need to implement this method for every model element, but only for those you want to forbid deletion. Just return false or implement some logic based on the model element state. That’s all, but what’s happening inside the OnStatusDeleteCommandLogic class? I’m looking for the selected elements (that are shapes in the editor or TreeNodes in the DSL Explorer) and check whether they implement the IDynamicCanDelete interface. If there is this interface I will call the CanDelete() method and if it returns false the delete menu command will be disabled and set to invisible. For the Editor I will check the shape and the corresponding model element. If there are multiple elements selected only one must report false to disable the command. The DSL Explorer provides a Delete All command on some nodes. For this command I will check all children but not the grandchildren. For more details please take a look at the source code. This article is part of a series. A table of contents can be found at the end of the first article. Part 2 contains a user guide and in part 3 I showed most of the internals of the library. For each connector there is a command named "Reroute" in the context menu of the DSL editor. Now I have to remove this command for the compartment entry mappings. If the user would use it, the layout of my connectors will be destroyed. Unfortunately I did not find an option, an extension point or anything else where I could change or handle this particular command or the context menu of the connectors. First I looked at the generated code of my Dsl and DslPackage project. There is a GeneratedVSCT.vsct file. In vsct files the commands are defined, but in this one I could not find anything with "Reroute". Then I searched for the string "Reroute" in all files and found nothing. I found no documentation for this command and was a little desperate. I needed to find the place where it comes from. I searched the whole VS SDK folder (text and binary files) for the string "reroute". A promising hint was found in the Microsoft.VisualStudio.Modeling.Sdk.Shell.dll file. Now let’s go to the Reflector and take a deeper look inside. After a while I found the Microsoft.VisualStudio.Modeling.Shell.CommandSet class. And hey, in the msdn documentation article for this class there is also the Reroute Line command mentioned. With this knowledge one can easily find the generated CommandSet.cs file as part of the DslPackage. In this file there are two classes AbcCommandSetBase and AbcCommandSet where Abc is the name of you DSL project. The design pattern of this classes is called double derived and can be found quiet often within the generated DSL code. The ...Base class stays abstract and derives from a class defined in the Microsoft Visual Studio SDK libraries, in this case from the CommandSet class I found above. All code created by the code generator is added to this ...Base class. The other class derives from the ...Base class and is empty – all parts of the project uses this one. Since it is declared with the partial keyword, the user can override ALL methods and change the behavior of all aspects of this class. That’s it. Pretty easy, but you have to discover where to add this logic. This article is part of a series. The table of contents can be found at the end of the first article. In that article you can also find a brief overview. In the second part there is a short user guide and a download link of the source code and binaries. I don’t want to explain every single detail of my code. If you want to go that deep, you have to read the source code yourself and maybe you will find some comments. I will only show you the fundamental parts of the CompartmentMapping library. When creating a connector from Shape A to Shape B how should I get and store the Compartment Entry information for the Reference Relationship? After that, the connector representing this relationship must be drawn in such a way that it seems to be a connector from one entry to another. What can a user do to destroy the layout of my connectors? And even more important: how can I prevent him from doing so? If the user deletes a compartment entry that is part of a relationship, the relationship needs to be deleted, too. There is the concept of Connection Builders used by the DSL Tools. While your day to day use of DSL, you don’t have to worry about Connection Builders since they will be generated by the DSL Tools code generator. But you can turn this generation off and provide your implementation of a Connection Builder for a certain relationship. (see number 5 in the user guide). The first two methods are used to determine if a particular ModelElement can act as source or target of you connection. For example you can check the ModelElement for a certain property to be set and only allow elements with this property as source and with another property as target, or whatever. With CanAcceptSourceAndTarget() you can check whenever a concrete combination of source and target ModelElements is allowed to be connected by your relationship. 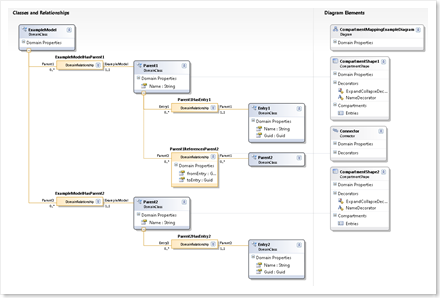 Last but not least with the Connect() method you have to create this new relationship for the two selected ModelElements. 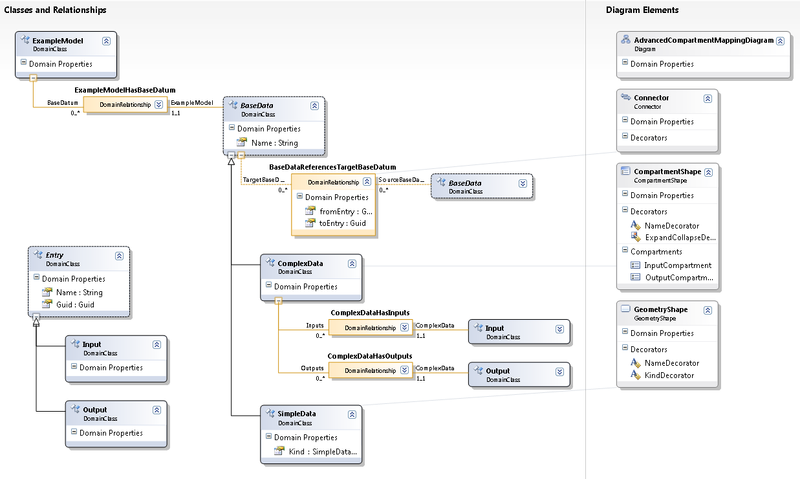 In such a Connection Builder I will add the logic to check not only the model elements but also the selected entry inside the Compartment Shape. At this point I will mix the model representation (containing of Domain Classes and Relationships) and the graphical appearance (containing of Shapes and Connectors) but there is no better way at this time since the DSL Tools can only create connectors from shape to shape. The first problem I ran into: How to get the shape of the model element in the Connection Builder if the only parameter is the ModelElement? I used the PresentationViewsSubject.GetPresentation() method and I’m hoping it will always work. The architecture is build in such a way, that one ModelElement can have multiple shapes, but I didn’t saw such a configuration until now, so I assume there will be only one shape. After holding the shape in my hand I need to know something about the selected Compartment Entry. This becomes a little bit complicated, too: Sometimes I need the entry right below the mouse cursor (for CanAcceptSource()) and sometimes the entry that was below the mouse when the user pressed the mouse button. Of course a Compartment Shape doesn’t provide any of that information. Take a look at CompartmentMouseTrack and ICompartmentMouseActionTrackable in the CompartmentMapping library and you will see in which way I handle mouse events of the shape to track all these mouse actions for the Compartment Shapes that are under the control of my library. With all these new information my CompartmentMappingBuilderBase can decide to allow or permit the creation of a connection. With some virtual methods, it can delegate more details of this decision to your code (see the advanced options here). 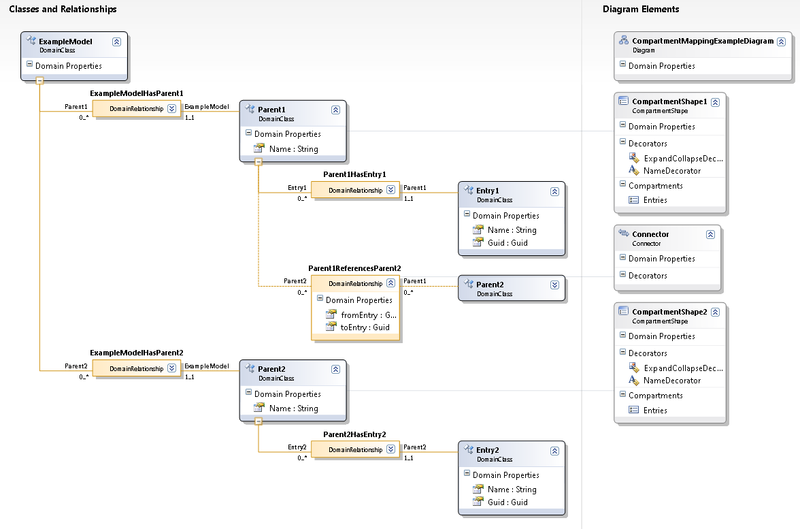 With the Connection Builder one can create relationships in the domain model but the connector inside the visual representation of your model will still be routed from shape to shape and won’t give you a proper understanding of the entry to entry relationship. So we have to change the routing in a way that the start and endpoints of the connector will be glued near to the entry on one side of the shape. This will be done with an AddRule (CompartmentMappingAddRuleBase) every time a new connector will be added to the diagram (and when opening a saved diagram). After determination the favored points on the shape outline you can set them to the connector with the FromEndPoint and ToEndPoint properties. Don’t forget to change the FixedFrom and FixedTo to VGFixedCode.Caller as well. If you change the start and endpoints of a connector in the AddRule these values aren’t set forever. 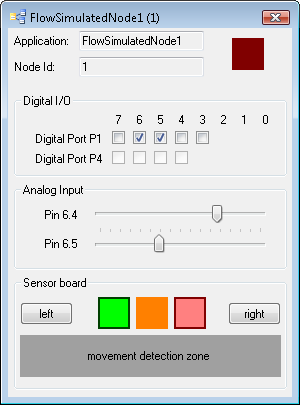 The user could collapse and expand the compartment shape or use the "Reroute" command that is visible in the context menu of every connector. He could also move the connector or only the start and endpoints on the shape outline. If he deletes one entry that was shown above an entry with a connection this entry moves closer to the top and the connection should do the same. With a few lines of code, we can forbid the user to change the routing of a connectors. In the connector class the CanManuallyRoute property simply have to return false. Every time the size of the shape changes (see OnAbsoluteBoundsChanged event) I will recalculate the connection points of all connectors assigned to this shape. This event will handle a bunch of cases for me: insertion and deletion of other entries, expanding and collapsing of the whole shape and singe compartment lists and renaming of entries which can cause reordering of the compartment list. The delete propagation is an easy requirement. I just added a DeletingRule that keep track of the deletion of certain Compartment Entries and if one is deleted it looks for Compartment Mapping Relationships and deletes them. It is a little bit challenging to find the relationships coming from the entry. If you want to know more details take a look at the CompartmentEntryDeletingRuleBase source code. In the last article of this series I will explain the way of removing the "Reroute" command from the connector context menu. The actual code consist only of a few lines, but the way I found the point to do it can be interesting for someone because the "Reroute" command is not proper documented anywhere. This article is part of a series. A table of contents can be found at the end of the first article. In that article you can also find a brief overview. If you read this article to this point you will properly use or at least evaluate the CompartmentMapping library. I will provide you with a step-by-step tutorial. There are pretty some steps, but its the shortest way I could imagine to create my solution. Please give it a try. You need TTxGen to generate some code from my templates. See my last article for more information and a workaround for an installation problem. 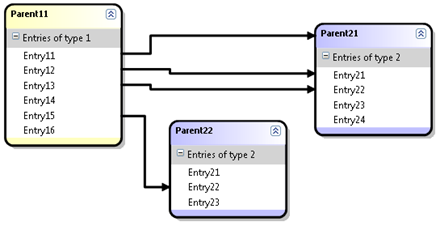 Create a Reference Relationship from Parent1 to Parent2. This will be automatically named Parent1ReferencesParent2. We will use this reference to present the relationship from one entry to the other. I would like to create Reference Relationships from this relationship to the entries, but relationships of relationships are not supported. We have to store the guids of the entries in the relationship and add two Domain Properties for this purpose to it. I named them fromEntry and toEntry. Add a reference to CompartmentMapping.dll to both the Dsl and DslPackage project. Now press the Transform All Templates Button in the Solution Explorer to generate the the code from this template. Now you have to write code by yourself (nearly by yourself, the frames are generated, too). Take a look at the generated cs file CompartmentConnections_xGen.cs. At the top you will find commented code. Copy this code to a new cs file and remove the comments. All code you will write for the compartment mappings you will write in this file. Complete the CreateElementLink() method in this file. Here you have to add code to store the selected compartment entries for source and target in the properties of the relationship (see 3). Always care for entry == null this will be used to check whether the head of the shape is meant. Even if you do not allow the head as source or target this method will be called with a null parameter from time to time. That’s all. Only 13 steps, a few settings and conventions and 10 lines of C# code to write. I know it is not very easy but I think it is ok. And the best: as you will see it is working. Now compile and start you solution. You can now create connectors from one entry of the Parent1 shape to an entry of the Parent2 shape. Great – isn’t it? Take a look at the properties in the Properties window when selecting a connector. You see the guids of the corresponding entries and can use them in your code when working with this connections for code generation or whatever you need to do. There are some more options besides the basics described above to configure and extend the compartment mappings. For CompartmentSource and CompartmentTarget you can specify an attribute called allowHeadAsSource (and allowHeadAsTarget respectively) and set it to true, to allow the head of the compartment shape as source or target. Remember, if you do this the CreateElementLink() method will be called with null values for the entries and you have to handle this. On the Connection element there are two more optional attributes, too. If you set allowSelfReference to true the user can create connections from one entry of one shape to another (or the same) entry of the same shape (source = target). This makes only sense if you specify CompartmentSource and CompartmentTarget to be the same Domain Class and the same shape. With the suppressEntryDeletePropagation attribute set to true you suppress the deletion of the connection when a corresponding compartment entry is deleted. Be careful with this setting: Wrong connections will remain in your model and produce ugly diagrams. One of source and target can be a regular shape (that is a geometry or image shape and not a compartment shape). Replace either CompartmentSource with Source or CompartmentTarget with Target. For these elements you don’t need to define a EntryDomainClass element since regular shapes do not have entries. You can add even more code to the C# file from step 9 to 11. There are two more methods you can override: CanAcceptAsCompartmentSource() and CanAcceptAsCompartmentSourceAndTarget(). If you do so, the DSL editor will ask your code while the user moves the mouse over shapes when creating the connection to identify the current shape and entry as a valid source or target in you scenario. It is pretty much the same pattern as used in the DSL Tools itself. But remember, this method will be called very often und should have a very short running time. The archive contains the library both as a compiled dll and as source code and the Example DSL created in this article. Part 3 and part 4 of this series will give an in depth view into the internals of the library.